Elixir Salon Spa is a neighborhood salon connecting artistic vision with everyday practicality. We strive to create an environment that is welcoming, fun and friendly. The brick walls, arched windows and high ceilings will draw you in, while the comfort and the people will keep you coming back. 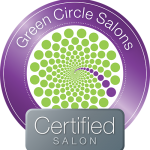 We are a Green Circle Salon: a certified sustainable salon where waste generated by beauty services is repurposed and recycled to eliminate impact on the environment. Visit greencirclesalons.com for more info.